Emergency Room Versus Emergency Dentist? Searching for an emergency dentist in Indianapolis, IN just got a lot easier. Emergency Dentists USA provides you with the easiest possible method of getting the next available appointment at an emergency dentist near you, all you have to do is call! We are a referral service that will connect you to an urgent care dentist near you! Simply call our 24 hour a day, 7 day a week hotline number and we can use our connections with emergency dentists in Indianapolis to get you set up with an walk in dentist right away. Last week I bit down on a piece of candy wrong and chipped my tooth, I was in such pain I couldn’t believe it. I had no idea what to do, so I googled emergency dentists in my area and this site came up. Instead of having to call several dentists and wait for a call back, the operator helped get me in touch with a Dr. right away! There are many instances where you will find yourself in pain on the weekends and in need of a walk in or after hours dentist. We have done extensive research and compiled a list of emergency dentists that can help in your time of need! Walk-in clinics allow a patient to just walk in, without an appointment. The best example of this type of clinic in Indianapolis is 24 Hour Dental Care. They’re open 24 hours a day, 7 days a week. On their website, they also have an option to check- in online. This is such a great feature because you can check-in and check on wait times before you even head to the clinic. If you are looking for dental care after hours, Immediadent Urgent Dental Care and Urgent Dental Center & Family Dentistry are the best choices per our research. Immediadent Urgent Dental Care is open 9 AM to 9 PM, seven days a week and Urgent Dental Center & Family Dentistry is also open 9 AM to 9 PM, Monday through Saturday. Both clinics are excellent and are able to take care of any dental needs you may have. Indianapolis does have a 24-hour dentist which is such great news as most cities do not. 24 Hour Dental Care is on our list below, this clinic offers emergency dental care 24 hours a day, 7 days a week, 365 days a year. This office is perfect for you if you’re experiencing an emergency overnight, on weekends or even on holidays! Description Our referral service is open 24 hours a day, 7 days a week and makes it so easy for you to connect to an emergency dentist near you. Call us and we will find a dentist that will work for you, and can even assist in setting up an appointment if it’s needed. It’s that simple! 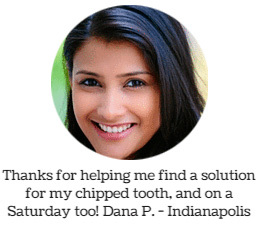 Easily find Indiana emergency dentists with our service. Description: 24 Hour Dental Care is always open and always affordable! With three locations currently and a fourth on the way, this clinic is your best choice if you are experiencing tooth pain late at night, on the weekend or on holidays. They accept most dental insurance plans, call to verify if your plan is covered. They also offer a Dental Discount Plan and financing through CareCredit. Description: Same day appointments and walk ins are always welcome at Immediadent Urgent Denetal Care. As a franchise within a 3-state region, this is an incredibly dependable walkin dentist practice that many students and working professionals use every day. They also offer financing through CareCredit. Description: If you’re experiencing a toothache in the Indianapolis area, this clinic’s emergency team can provide urgent care for nearly any dental emergency. With two locations and their amazing hours Monday to Saturday, you’ll be sure to get an appointment quickly. They also offer flexible payments, discount programs, and promotional offers. What Should You Do To Prepare For Your Emergency Dental Appointment in Indianapolis? An emergency dentist visit is very similar to a regular dental checkup. You will want to arrive 15 minutes early, if at all possible, in order to have time to fill out the necessary paperwork. This allows the Dr. and staff to have your medical information, allergies, etc in order to treat you quicker and more efficiently. If you are in pain, please inform the front desk staff so they can get you in to see the Dr. right away. You’ll also want to have an idea on how you’ll pay for your visit. Most of the emergency dental clinics accept dental insurance, but you’ll want to check with the office to verify if your specific plan is covered. You can also discuss with them the forms of payment they accept, and what financing they have available, if necessary. There are many reasons you would need to see an emergency dentist. Some of the typical reasons why you may need to see the emergency dentist are an abscess, chipped tooth, broken jaw, lost tooth, cracked or broken tooth, and damaged braces or wires. When these situations arise, you will want to contact an emergency dentist in Indianapolis and get in to see them as soon as possible. If you suffer from a sports injury, car accident, fall, etc where there is more injury to your person than just damage to teeth, you’ll want to head directly to an emergency room. They will be able to treat the other, more pressing, injuries first. Once those are treated, they will refer you to a dentist to treat the damage to your teeth the accident caused. Emergency rooms are excellent to handle bodily injuries, however, they are not equipped to handle most dental emergencies. If you do visit an emergency room for a dental emergency only, they will likely prescribe pain medication or an antibiotic and refer you to your dentist or an emergency dentist in your area. Indianapolis provides plenty of opportunities to see an emergency dental professional, whatever the need may be. Above we have provided a list of several dental offices that are open extended weekday and after hours, as well as weekends. You can also let us do the work for you! Our referral service, Emergency Dentists USA, will help you find the perfect dentist to fit your needs, 24 hours a day, 7 days a week and all you have to do is make one quick call. We also suggest checking with the local dental association to ensure the dentist of your choosing is licensed and certified. For Indiana, it is the Indiana Dental Association. You can also check a dentist’s certification at the American Dental Association.